This book is set in Georgian England and tells the story of 15 year old Sophie who lives under the tyrannous rule of her traditional Father. Forced to attend a series of balls and other social pointless gatherings, it's not long before Sophia is looking for ways to escape. And it's not long before she dons breeches and shirt, pistol in hand, shouting "Stand and Deliver!" Can Sophia keep her night life a secret or is she playing a dangerous game? 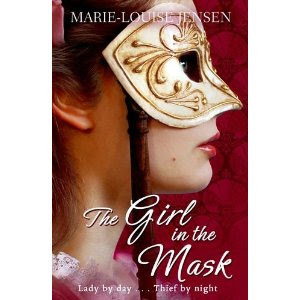 I was super excited when I found out that Marie-Louise Jensen had another book coming out. I reserved it from my local library and read it in two days. It was immediately gripping and I loved the brave character of Sophie, she wasn't going down without a fight! I also loved the character of Jenny who I really felt for despite her trying to be tough attitude! I knew I wouldn't be disappointed as I had loved Jensen's other books such as The Lady in the Tower. I thought the setting was written very powerfully, I could almost smell the rotten water of the Bath springs. I was a tiny bit disappointed with the romance in the book, I thought it would have been more powerful but maybe that is just my cheesy side showing through! The book has a very clear and concise structure and even though Sophie found the social gatherings tedious, Jensen didn't bore us with the details. The book had some comedy in it and I found myself chuckling over some cleverly delivered wit. I can tell from the ending that the book will have a sequel and I very much look forward to it. All in all I would definitely recommend the book as it a breath taking gripping ride! I love how Marie-Louise can describe the setting perfectly, no matter what she's writing about!